Sonia Smith, DNP has more than 30 years of pediatric nursing experience. 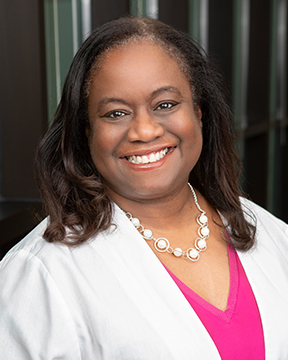 In addition to bringing her expertise to pulmonology and sleep medicine, she has extensive knowledge and proficiency in primary care, neurology and emergency medicine. She currently serves as an adjunct assistant professor at the ... Read More University of South Alabama in Mobile. Smith received a bachelor’s degree in nursing from the University of North Carolina at Greensboro, a Master of Nursing in child health from Emory University in Atlanta and a Doctor of Nursing Practice from Troy University in Alabama. She has been published in several peer-reviewed journals, including the Journal of Pediatric Health Care. Smith has lectured locally and nationally on various pediatric health topics and is heavily involved in several pediatric health and nursing education research initiatives. She is a member of the National Sleep Foundation, the American Academy of Sleep Medicine, the American Telemedicine Association, the American Association of Nurse Practitioners and the National Association of Pediatric Nurse Associates and Practitioners, of which she was past president of the Georgia chapter.